• Adrian Dater, Versus.com and Denver Post: “Raleigh is officially now a real hockey town in my book” and “Carolina on My Mind, and I’m Lovin’ It"
• Mike Green, Washington Capitols: "Thanks Carolina for the weekend. It was an amazing experiance." • Kevin Weekes, NHL Network: @KevinWeekes BIG success this All Star was ! On the hockey fans in NC I'll quote Biggie " If you don't know,now you know" - take a bow NC ,great job! • Helene Elliott, Los Angeles Times: @helenenothelen Thanks, Raleigh and the Carolina Hurricanes. Great hospitality for the All-Star Game. Well done! • Darren Dreger, TSN: @DarrenDreger Raleigh did a great job this wknd. Hospitality has been terrific and the Hurricanes should be commended for hosting a first class event. • Bruce Garrioch, Ottawa Sun: @SunGarrioch People of Raleigh can take a bow. Great all star weekend, embraced the event and nice people. Ottawa has its work cut out for them. • Matthew Barnaby, ESPN: @MattBarnabyESPN Thank you to raleigh for all your hospitality over the last s days. Great people- great fans!! • Frank Seravalli, Philadelphia Daily News: @DNFlyers Thank you, Raleigh, for an unbelieveable weekend. I think this weekend changed the opinion of many about hockey in the South. Well done! 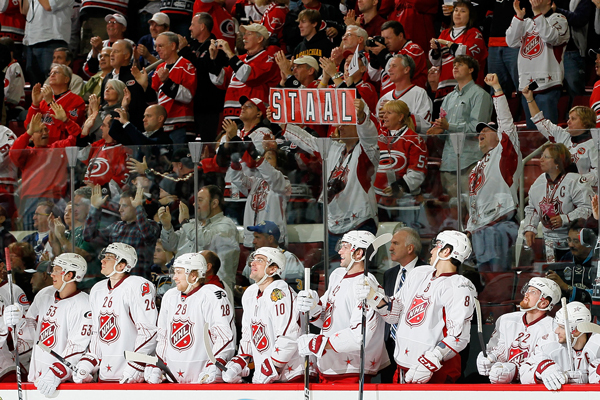 • Dan Rosen, NHL.com: @drosennhl Gotta give all kinds of credit to Raleigh and the fans here. The city has been rocking for 3 days and it's a blast outside RBC right now. • Michael Kim, ESPN America: @MKimESPNAmerica Kudos to the city of Raleigh, NC, the Hurricanes & The Caniacs for a great AllStar wkend. • Sam Carchadi, Philadelphia Inquirer: @BroadStBull Not real big on the #NHL ice capades. Um, I mean, NHL All-Star Game. But Raleigh was a great host city. 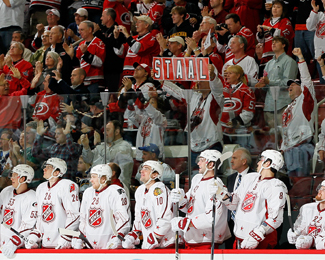 • Mark Fischel, NHL: @NHLFischel Canes fans and the city have been amazingly impressive, and the atmosphere feels like a life-long tradition. • Eklund, Hockey Buzz: @Eklund This is BY FAR the loudest and most “into it” crowd I have EVER heard at a skills competition. It's a party in here! Canes fans rock. • David Pagnotta, The Fourth Period: @TheFourthPeriod: Absolutely outstanding time in Raleigh for the NHL All-Star Game. The weekend was a big success. • Chris Johnston, Canadian Press: @reporterchris: Just made it back to Toronto after a lengthy delay in Raleigh. Had a great all-star weekend. • Mike Sundheim, Carolina Hurricanes: @MikeSundheim Not sure I could be any prouder of my city or our fans right now. What a weekend.